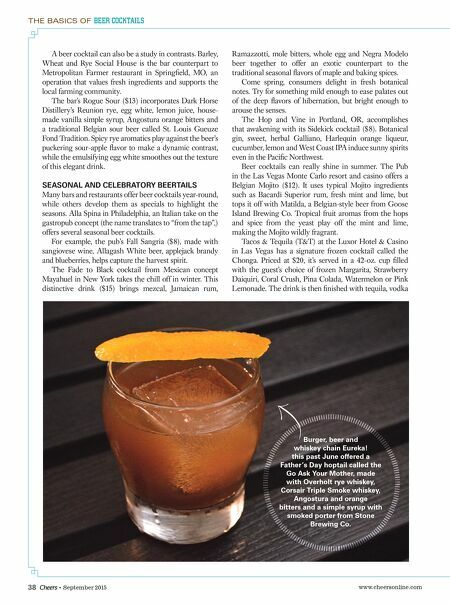 www.cheersonline.com 39 September 2015 • or rum, and topped off with two upside- down 7-oz. minis of Sol beers. Signature beer drinks can also promote holidays and special occasions. "We keep at least a couple of beer cocktails on our everyday menu, and I always try to do something fun with seasonal beers," says Dylan Fox, bar manager/beverage coordinator for Barley, Wheat and Rye Social House. For instance, he notes, "this past winter we did a cocktail called the Social House Breakfast, which included rye whiskey, orange juice, egg white, local coffee, and our local Mother's Wintergrind Coffee Stout." Eureka!, a chain of burger, craft beer and whiskey restaurants in California, Texas and Washington, this past June offered a Father's Day weekend hoptail called the Go Ask Your Mother. Priced at $12, the unique take on the Old Fashioned used Overholt rye whiskey, Corsair Triple Smoke whiskey, Angostura and orange bitters and a house- made simple syrup with smoked porter from Stone Brewing Co. You can also create beer-based beverages to go with specifi c cuisine. Malai Kitchen in Dallas specializes in food from Southeast Asia. The restaurant's Thai Shandy mixes Hayman's Gin, lemongrass, Kaffi r lime, ginger and lemon juice; it's then topped with Thai-P-A, a medium-bodied IPA brewed with Thai herbs by Malai Kitchen owners Braden and Yasmin Wages. A FEW HELPFUL HINTS Before developing a beer cocktail recipe, consider your audience and establishment. The suitable drink for a playful Las Vegas resort will likely not be a fi t for a formal New Orleans restaurant. You can start by substituting different beers for club soda and then experiment by using beer in simple syrup or foam. Pull from traditional techniques and recipes or add a 21st century twist. Keep your options open when crafting beer cocktails, Fox advises. "If you have an idea, make it a reality—and of course, have fun with it." It's also a good idea to work with a beer that can be served in small portions—from the tap or a 12-oz. bottle is ideal, since large-format bottles can lose carbonation and oxidize once opened. And keep in mind that the price point of beertails should be within range of other cocktails on the menu. So an expensive combination of beer and spirits may prove unsustainable. Beer cocktails are in a sweet spot in terms of popularity—not rare, but also not quite yet mainstream. Offering them as regular drink menu items or specials shows customers that your beverage program is on point and innovative. "Beer cocktails add a whole other family of cocktails to our menu," says Philip Ward, co-owner and beverage director at Mayahuel. "They offer something that many other places very often don't." 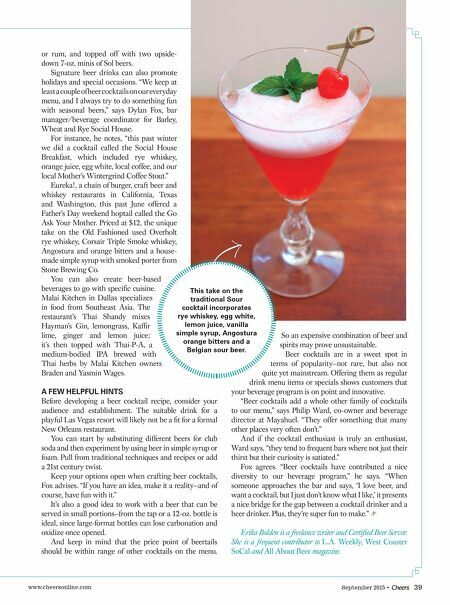 And if the cocktail enthusiast is truly an enthusiast, Ward says, "they tend to frequent bars where not just their thirst but their curiosity is satiated." Fox agrees. "Beer cocktails have contributed a nice diversity to our beverage program," he says. "When someone approaches the bar and says, 'I love beer, and want a cocktail, but I just don't know what I like,' it presents a nice bridge for the gap between a cocktail drinker and a beer drinker. Plus, they're super fun to make." Erika Bolden is a freelance writer and Certifi ed Beer Server. She is a frequent contributor to L.A. Weekly, West Coaster SoCal and All About Beer magazine. This take on the traditional Sour cocktail incorporates rye whiskey, egg white, lemon juice, vanilla simple syrup, Angostura orange bitters and a Belgian sour beer.